CLEVELAND (AP) — From disorganized and dysfunctional to disciplined — and according to rookie quarterback Baker Mayfield, dangerous. The Cleveland Browns are looking a lot better these days. Not great, but improved. Greatly improved. Two weeks after coach Hue Jackson’s long overdue firing, the Browns showed a glimpse of a brighter future with their best all-around game in several seasons, a convincing 28-16 victory on Sunday over the Atlanta Falcons. Taking their cues from Mayfield and interim coach Gregg Williams, whose odds of becoming Cleveland’s next full-time coach may not be as ridiculous as they once seemed, the Browns (3-6-1) took apart a team with playoff hopes. Cleveland was balanced on offense, sound defensively and the Browns’ special teams avoided the kind of fatal mistakes that led to so many tough losses earlier this season. Matched up against one of the NFL’s best in Matt Ryan, Mayfield was nearly perfect while outplaying his more celebrated quarterbacking counterpart. Mayfield completed his first 13 passes, finished 17 of 20 for 217 yards and threw three touchdown passes as the Browns posted their largest win since Dec. 13, 2015 — a span of 44 games. 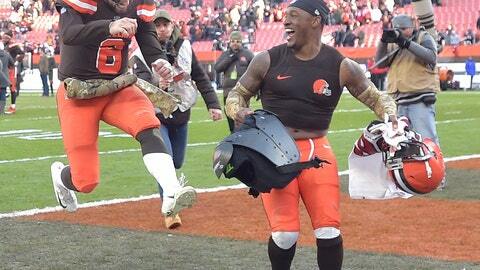 When it ended, with the rare sight of Cleveland fans actually still in their seats cheering and not heading toward the exits, Mayfield met Ryan and shared a hug with Atlanta’s star at midfield before filming a promotional selfie video for the team’s website and then sprinting off like a 10-year-old and leaping and bumping with Randall in the end zone. Moments later, Mayfield playfully told reporters he woke up feeling “pretty dangerous.” He’s been scary over the past four weeks, throwing nine TD passes with just two interceptions and making better decisions. It was Mayfield’s second game with offensive coordinator Freddie Kitchens, the team’s running backs coach thrust into the coordinator’s role when Todd Haley was fired after Jackson on Oct. 29. Kitchens has catered Cleveland’s offense to suit Mayfield’s strengths, and his quicker throws have been effective in moving the ball and keeping him safe. For the first time this season, the Browns did not give up a sack. Williams said the Mayfield-Kitchens pairing will only get better. Williams, too, should take a bow. In no time, he’s made the Browns better. Sometimes brash and boastful, Williams has toned down his public personality while providing strong, needed leadership to a team that had tuned out Jackson after two losing seasons. The Browns are responding to the 60-year-old Williams, who coached Buffalo from 2001-03 and worked his way back up the ranks after he was suspended by the league in 2012. Williams laughed hard when asked if the past two weeks have reminded an “old timer” he still had what it takes to be a head coach. “I never thought it left,” he said. But as far as his future in Cleveland, Williams insists he’s not campaigning for the job. At this point, the Browns’ play is doing the lobbying for him. When pressed about whether he would like to be the next coach of the Browns, Williams showed a politician’s elusiveness. NOTES: Williams only planned to give his players Tuesday off, but “threw them a bone” following the win and gave them Monday as well. The players are free this week with the exception of medical treatments and phone meetings. … Williams said LT Greg Robinson “played well” in his second start, but that doesn’t mean he’ll stay in the lineup following the bye. Rookie Desmond Harrison started Cleveland’s first eight games before being sidelined with an unspecified illness.